Members of Balla No Name Club have a Santa Stop Here display, which features Mr & Mrs Claus in McGreal’s old furniture shop in the centre of Balla, the funds raised are to enable the purchase of a palliative care bed for the new Hospice Unit in Castlebar. There’s a donation box in the door. Photo © Ken Wright Photography 2016. 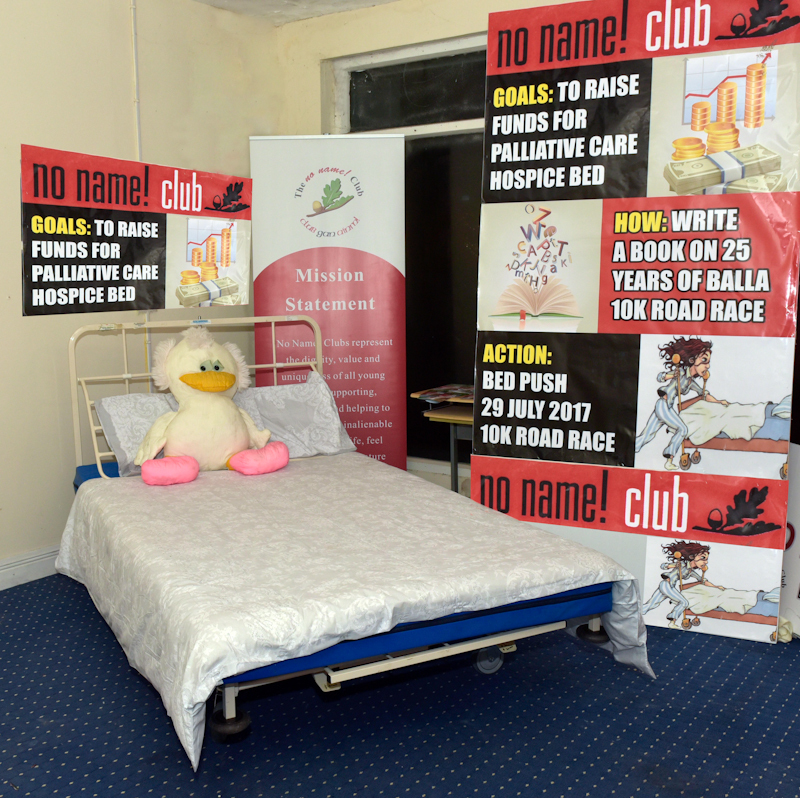 As part of the 2016/2017 No Name Club Hosts and Hostesses members, a special project group was formed after much brain storming and heated exchanges, it was decided that this year's project is to buy a palliative care bed for the new Hospice Unit in Castlebar. 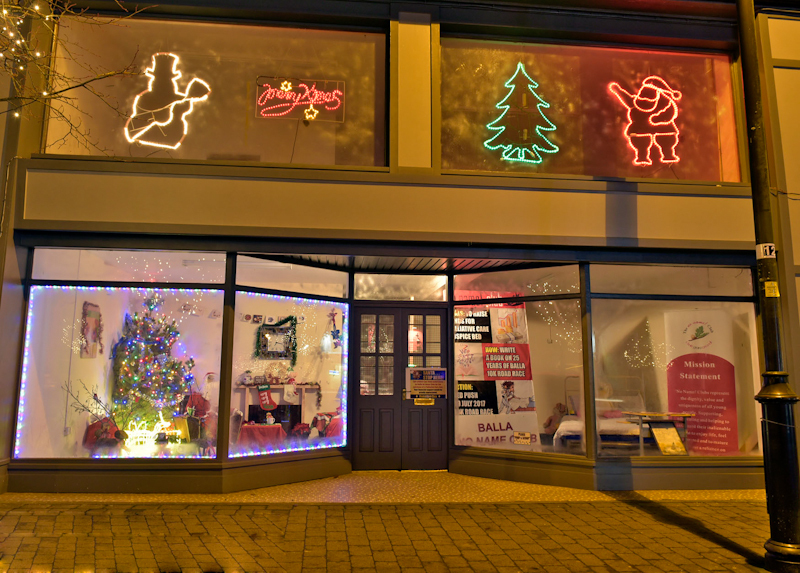 The first part of the project was to set up a Santa Grotto in McGreal's old furniture shop in the centre of Balla with the theme "Mr and Mrs Clause at home by the fire", with a donation box in the door to accept donations. This will remain there until the 6th of January 2017. Also a special account has been set up in Balla Credit Union. The club would like to thank Anna King of First Choice Credit Union and the children of Manulla National School who preformed beautiful Christmas carols for the opening of the Santa Grotto last Sunday. A special thanks to Martin and Bernie Roughneen for giving us three beautiful handmade reindeers for our display. Thanks to Pat Moran for his talented singing. Thanks to Brian Tansey for providing the premises and also to Cllr Henry Kenny for his attendance. And finally a big thanks to the parents and friends who joined us afterwards for tea and biscuits in our club. Part two of this project will commence in the new year. Happy Christmas and a very happy new year from all at Balla No Name Club. 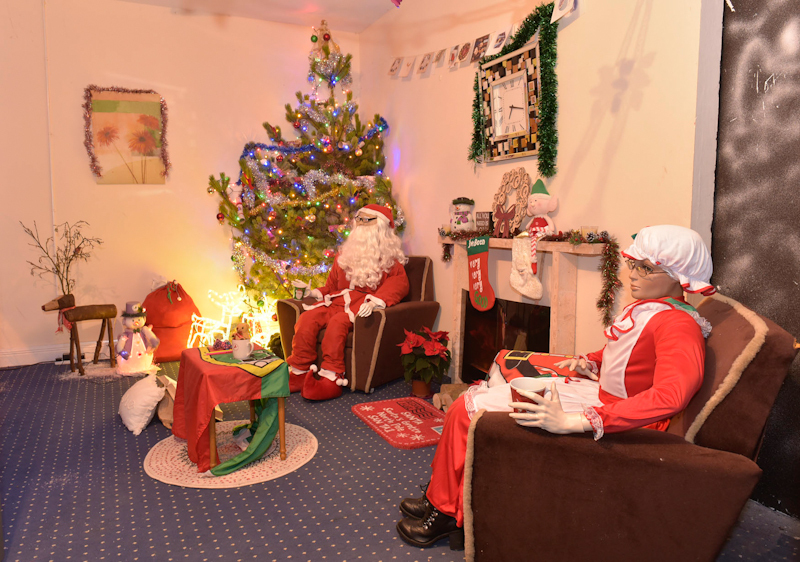 Members of Balla No Name Club have a Santa Stop Here display, which features Mr & Mrs Claus in McGreal's old furniture shop in the centre of Balla, the funds raised are to enable the purchase of a palliative care bed for the new Hospice Unit in Castlebar. There's a donation box in the door. Photo © Ken Wright Photography 2016.